If you've visited here before, you might have noticed some changes. Let me introduce you to Rove Handmade, a new brand that seeks to engage creativity with simple, minimalist crochet patterns designed in natural, sustainable fibres. You'll still find patterns and how-to's previously published under Maria Valles Handmade, now under a new name and a freshened-up online home. Rove Handmade represents the next step for me in this handmade endeavor of mine, as I begin to think more carefully about designing, making, and sustainability. It is the culmination of several months of pondering, planning and hard work, and I'm looking forward to seeing where this next chapter leads. In celebration, I am excited to share with you Rove Handmade Volume 1: Grannies, a collection of four easy crochet patterns for simple and stylish shrugs and cardigans. Inspired by crochet’s most famous motif, the granny square, these patterns also showcase beautiful Icelandic wool yarns in earthy undyed shades. The collection features two brand new patterns along with my best-selling Duo Two-Way Shrug and a new-and-improved pattern for my Granny Cocoon Shrug (previously published as free "recipe" here on the blog). Each design employs inventive construction based on squares or hexagons, with no special shaping and minimal seaming, making these great projects for those crocheting their very first garment. Patterns include detailed instructions for five adult sizes, as well as schematics and notes on customizing your piece. You’ll also find tips on working with Icelandic wool and notes on yarn substitutions. Check out the ebook and individual patterns here! Last week I finally published my Duo Two-Way Shrug on Ravelry. This one was a long time and a few versions in the making, but I'm quite pleased with how it turned out and thrilled by the wonderful response it's been getting on both Instagram and Ravelry. Thank you to all who left kind words or have already purchased the pattern! 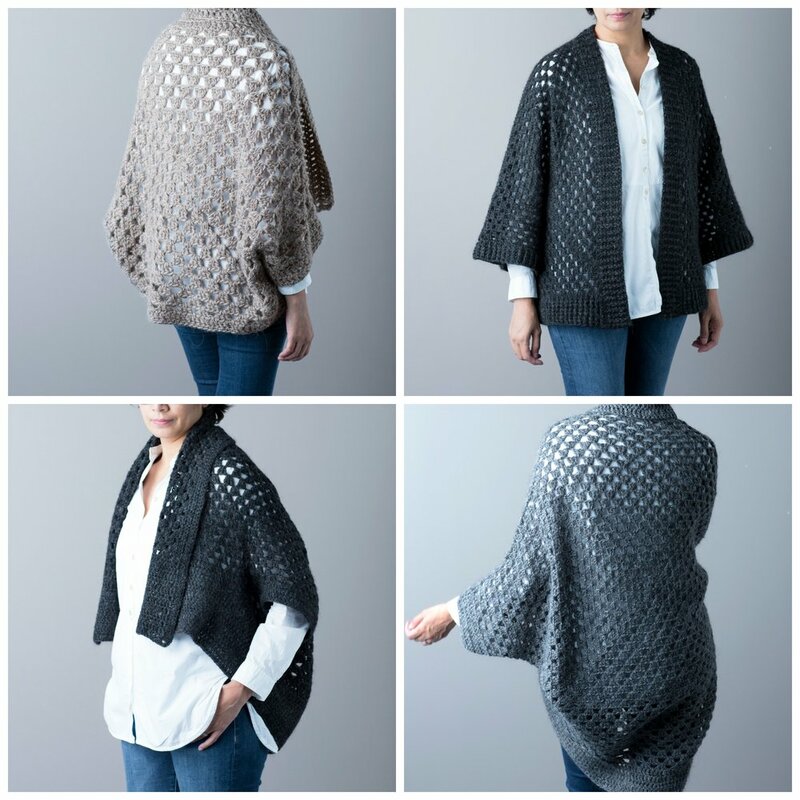 Built on the granny square, Duo uses basic stitches and construction to create an elegant, versatile piece that can be worn as a short-sleeved open cardigan or turned upside down and worn as a cropped, shawl-collared shrug. It has a slight cocoon shape at the back and is meant to be worn with a bit of positive ease. I designed Duo for plötulopi, a light and airy single-ply unspun Icelandic wool yarn, but the pattern can be made a worsted weight yarn such as Léttlopi and notes are included for yarn substitutions. In Léttlopi, for example, the gauge is identical and the result is a little more "springy" though no less lovely - I've been wearing both versions and I'm honestly not sure which is my favourite (it's shown here in plötulopi) . Duo is available in five sizes. As I slowly work my way through the backlog, I'm pleased to introduce yet another cowl pattern, now available on Ravelry and Etsy. This one is called the City Cowl and is made with one ball of Álafoss Lopi and a big-ish 10 mm hook, and uses one of my favourite stitches, Griddle Stitch, to achieve a beautiful texture and drape. It's also simpler than it looks and is suitable for advanced beginners who want to venture a little beyond the basics. I just opened a Ravelry pattern store! And I've uploaded my first pattern for sale - the Two-Tone Toque in Álafoss Lopi (what else?). I made this hat (and a few others just like it) quite some time ago for my Etsy shop - I'm just now finally working on getting some of my patterns written up properly and formatted, and this is the first one I've posted for sale, as a PDF download, for actual money. We'll see how it goes. I love this pattern because it works up super quickly (very satisfying), and using a larger-than-recommended hook size with this yarn makes it extra soft and light. Lopi can be a bit coarse, so gentle washing and blocking helps to soften it too. The hat is worked top-down using basic stitches, and the scruffy pompom is made without a special pompom maker (although you can use one if you prefer).